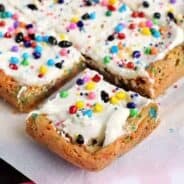 Chewy and butter-rich Cake Batter Blondies are so easy to make! Don’t forget to top them with the sweet cake batter frosting too for an over the top dessert! Sometimes I get a little overzealous when it comes to a good sale at the grocery store. I find myself buying things that normally don’t end up in my cart. And not just buying one or two…but I am a sucker for the 10 for $10 trap. Even though I can just buy one for $1, I am instantly throwing 10 of whatever (cake mixes, chips, granola bars, etc) into my cart. I then get home and have buyers regret. Not because we won’t eventually eat these items, but because I have no place to STORE all these items. If you’ve been coming to the blog for any period of time here, you’ll know I prefer to bake from scratch. But I don’t mind every once in awhile to grab a box mix of brownie or cake mix and doctor it up a little bit. Sometimes that’s part of the challenge! Another thing I like to do is add cake mix (or brownie mix) to other recipes. 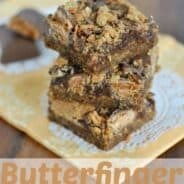 For instance, this Cake Batter Fudge has dry cake mix added in to give it a butter-rich, chewy texture! Or this Frosted S’mores Brownie Fudge with dry brownie mix added in to give it a fun chocolate-y flavor! 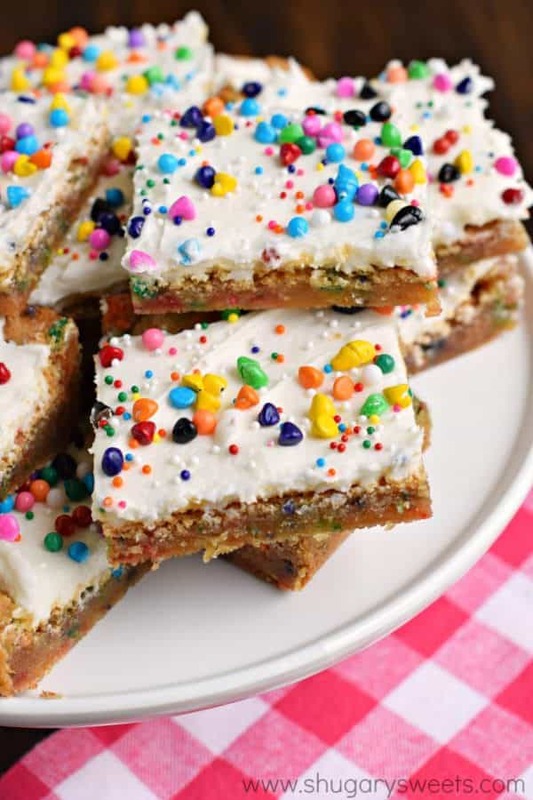 Today’s recipe for Cake Batter Blondies is crazy easy. And like a cake, I HAD to add frosting to the top of this sweet, chewy treat. ENJOY! 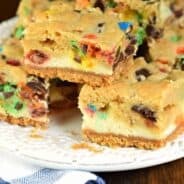 Chewy and butter-rich Cake Batter Blondies are so easy to make! Don't forget to top them with the sweet cake batter frosting too for an over the top dessert! Preheat oven to 350°F. Line an 8-inch square baking dish with parchment paper. Set aside. In a large mixing bowl, combine brown sugar with melted butter. Add in egg, vanilla and salt. Mix until blended. Add in flour and cake mix, stirring JUST until combined. Fold in sprinkles. Pour batter into prepared baking dish. Bake for 22-25 minutes. Remove from oven and cool completely. While blondies are cooling, prepare the frosting. Beat butter with milk, powdered sugar, and yellow cake mix. Once smooth, spread over cooled blondies. Add sprinkles. (I used a combination of fun sprinkles and rainbow chips). ENJOY! 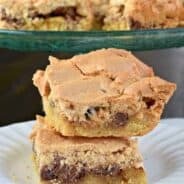 Nutella Blondies: chewy blondies with thick swirls of creamy Nutella! 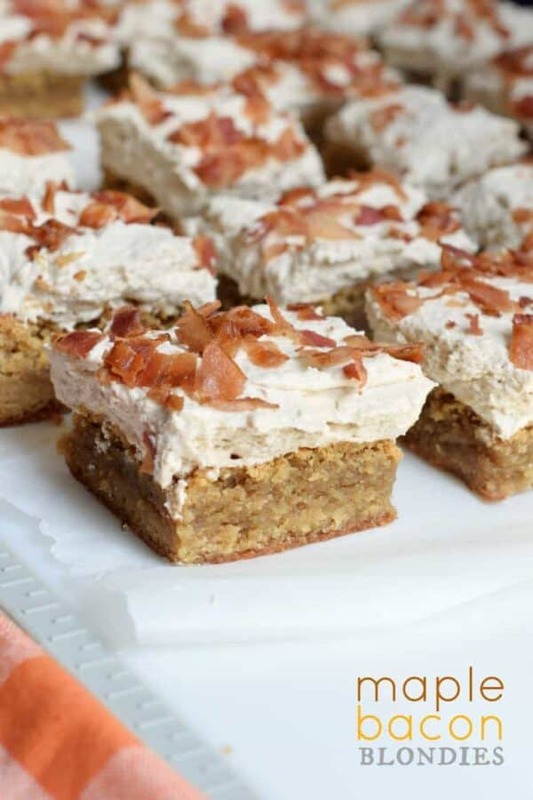 Maple Bacon Blondies: if you’ve never enjoyed bacon in your sweets…give this one a try! I promise it’s amazing. 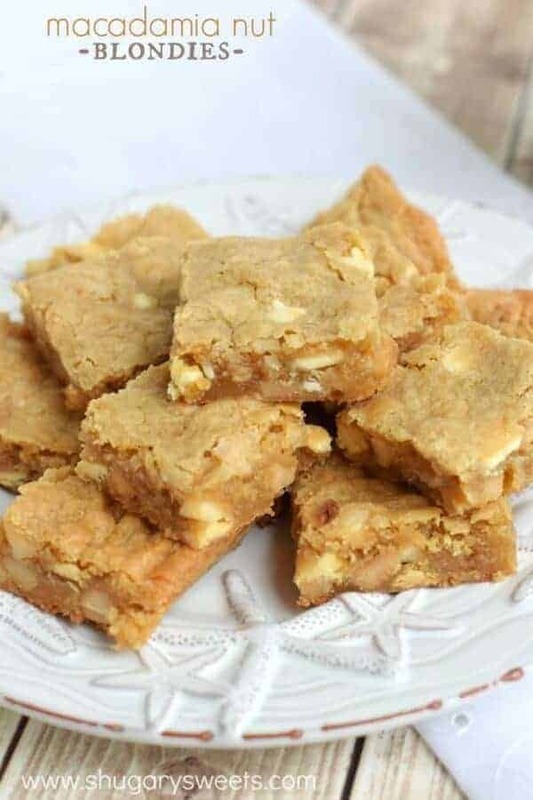 Macadamia Nut Blondies: your favorite cookie is now a chewy blondie! Oh my goodness, I buy EVERYTHING at the store. I always feel like I can use them whenever, and it’s such a great thing to be stocked, right? I’m not a grocery store shopping addict, right?! These look incredible. The love is there! I often buy a lot I don’t need when grocery shopping too…especially when it comes to the baking aisle! These blondies look SO good! I love the cake batter flavor! Oh YUM! 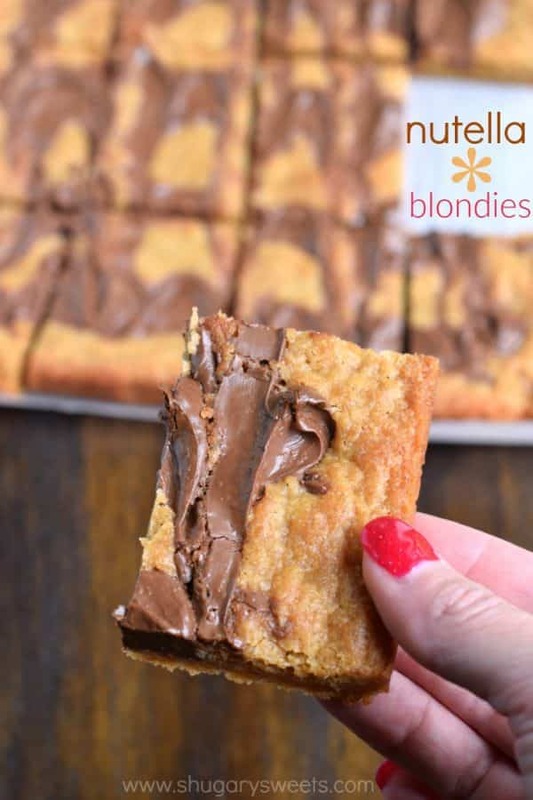 These Blondies look amazing, I think I would have a difficult time stopping with one or two! 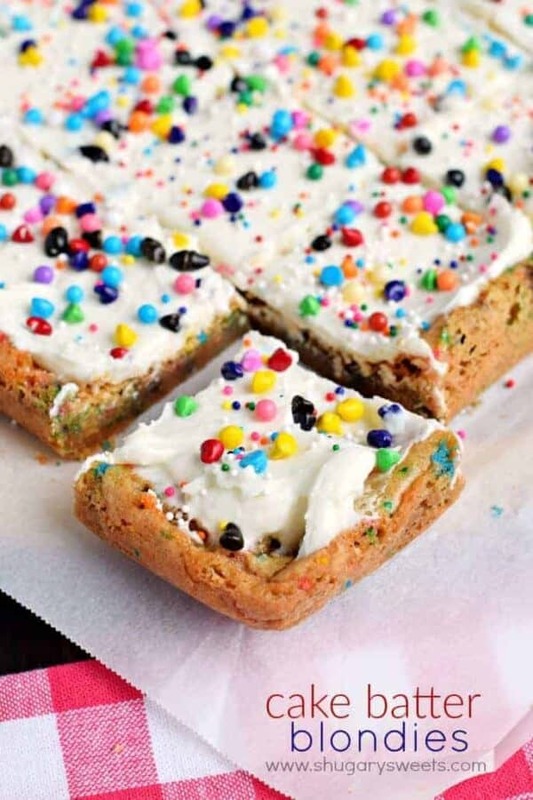 These cake batter blondies look so chewy and delicious! 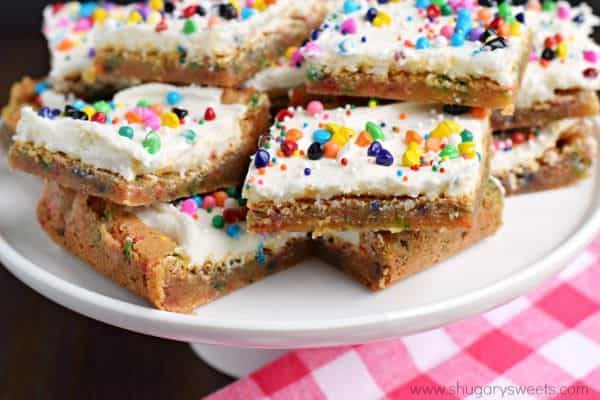 I love all those sprinkles in them and on top, such a fun treat! Oh Aimee, a thousand times yes! 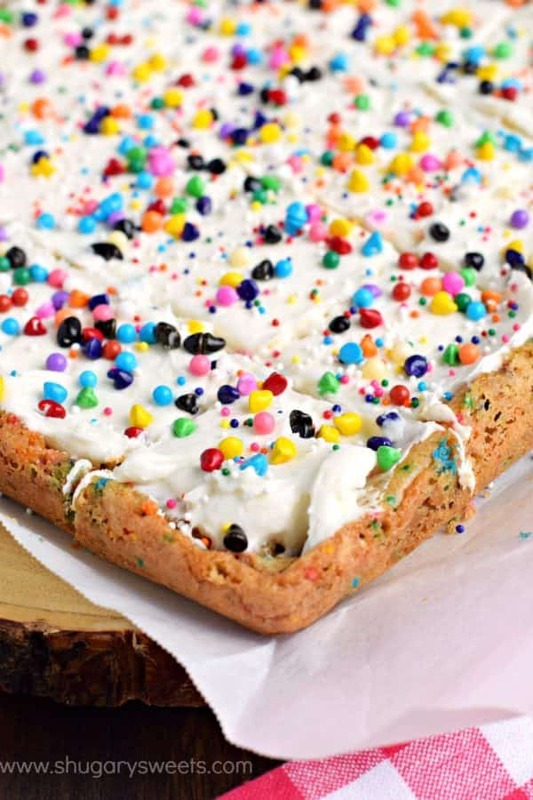 I love anything with cake batter and sprinkles! Pinned! These are so fun! I love the frosting includes the cake batter – yum all the way through! Hahahaha! That 10 for 10 sale always gets me too! Of course I need 10 box mixes or goldfish bags!!! And of course I need more blondies in my life! Love the cake batter version! What fun blondies! These look perfectly soft and chewy! MMM you had me at cake batter frosting!! LOVE!! Those look incredible and so fun! My kids would adore them. Wow this looks so delicious .